Well, I'm fighting my hangover today. I can't even tell you the last time I drank a bottle of Monte Velho red wine. From today's headache speaking it must be a while. My A-wesome girlfriend Camilla and I started nipping a glass of wine while having dinner and got involved in a conversation. We quickly build it up to a hot steam debate about life and shared stories with wild gesticulating arms (me), wide-open eyes and straight-forward questions. When Camilla's husband Nuno arrived home, we got the fact, that we totally lost time and had finished the wine realizing tomorrow would be W-W-Wednesday!! Speak: no sleeping in. Anyway, the uplift of a spontaneous evening like this is so refreshing; I don't even care about my headache. And here's what I'd love to share with you from our conversation on motherhood. When you want to bring out the best in your child, you'll need to bring out the best in yourself. I mean not only physically (aka looking stunning - and I know you do) but emotionally, intellectually, spiritually. You'll need to challenge yourself to design the most vivid life and own it from the most honest and comprehensive place inside of you. It's an ongoing, ever-changing process. There's always something new to discover, explore, work through. And your kid(s) walk(s) along with you and learn(s) by example. It requires courage, strength and hard work as a sense of self-love and not only the strict discipline to pursue what you love. And that's, where I think, my regular practice of Ashtanga Yoga, got me on track. To be able to develop this incredible stamina and will to grow and build my path every step along steadily. Aren't we here to help each other, I'm asking? 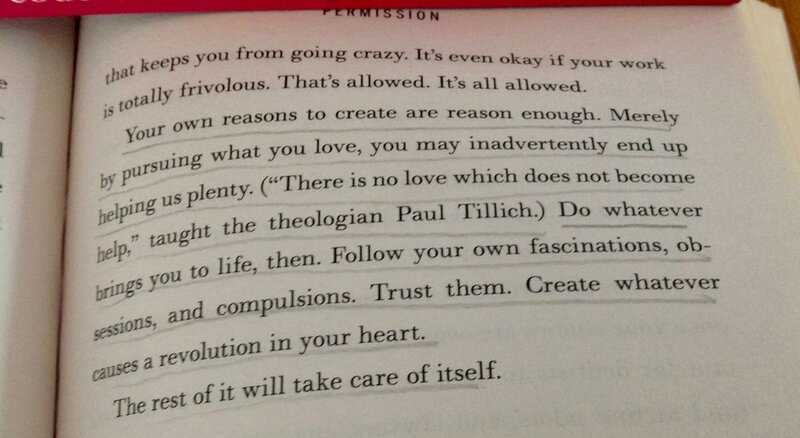 I took this wise snippet from the book "Big magic" by Elizabeth Gilbert. It's one of my favorite of all times because it helped me significantly to understand essential insights from my Ashtanga Yoga practice. I'm curious, *|FNAME|*, are you willing to do better every new day? How do you thrive? And if it applies to you, how has your Ashtanga Yoga practice helped you so far? Send me an email to roomformyself@gmail.comand share! Because you're needed to "enrich and inform our own lives" - taken from "Big Magic". Here's to Wednesdays and a good glass of wine! With SO SO MUCH LOVE ❤️🙏! 1. Tuesday in a month: LED CLASS 12:45 - 14:15 hrs. Tuesdays and Thursdays: MYSORE STYLE 12:45 - 14:30 hrs. Your first experimental class is absolutely free! Feel welcome! I had a breakthrough the other day. One of these fabulous warm winter evenings last week we needed to end on the beach.The air was soft and salty, the sea quiet, small waves moving calmly in an even rhythm. Protected by the moonlight my son Zion was running in the sand meters away from me. Looking into the stars, spreading his arms, feeling his freedom. Now and then I heard him calling out: Mom, come and catch me! And after enjoying my moment I did speed up to play. After ma-a-a-any catches and out of breath we quietly walked side by side back. Oh Mom, he said, you don't need to buy anything there. It's just me. I want to choose a delicious juice. It dawned on me: empathy. understand his feeling of being in need to drink something that he loves in a place that's ok for him. speak about how I understood it and I explained why I wouldn't choose the bar. I've come to understand, that Yoga can be applied as a method to self-reflection; to begin to explore, who you indeed are. Because to give empathy, or in other words, to understand somebody's feelings, you'll need to be able to connect with this feeling and distinguish from it within yourself. And, the deeper you know yourself the better empathy's to give and receive. Speaking from my more than ten years of experience with a consistent Ashtanga Yoga practice empathy becomes tangible, even embodies. It turns out to be an incredibly deep feeling of connection. So yes, I gave Zion his coins and joint him to choose his drink. In your everyday life, there're countless hidden nuggets of wisdom. When you listen carefully to whom surrounds you, you'll get the hints, insights, answers, new questions and understanding that are meant for you. Like me with my simple and clear empathy breakthrough. Please share in the comment below, what's this one memory about a breakthrough in your everyday life? Because I'd love to get to know you too! P.S. : How much do you feel understood? Forward this email to who you love and start the conversation! P.P.S. : Does it cross your mind to practice Yoga? To give it a try? Then hit reply to roomformyself@gmail.com, and we'll talk about you and what I can do for you. On Mother’s Day I received this comic, sent by beautiful woman, mother and inspirational Yoga Teacher Silvia Stojanovic. I was laughing out loud and thinking, hell yeah, that’s our mask - the super hero - having the roles all together. Woman, mother, partner, entrepreneur and friend. Graciously, Im able to say: not quite, my friend. It’s not like this. I’ve found, fulfilling and combining these roles in daily life’s indeed physically and psychologically very demanding and the person, that falls short often is the one behind this mask. I feel disconnected with myself. I don’t know, where “I” went. I search for reinventing myself. In fact, speaking out loud these sensations is already a connective moment, in which you ask for your self. It can be a possible beginning or in new phase of internally thriving, seeking and growing in life and to believe, there’s more beyond the roles. The basic dignity of being alive in your beautiful human body. How could you take care of yourself so you’re able to keep enjoying your roles and life without losing you? How could you rise and evolve, when sometimes time and space seem a way to short? How could you hold the space for others, when you’re feel empty, tired, disconnected? Ashtanga Yoga as a way of taking care of myself. Ashtanga Yoga is also called a breathing method. I believe, the breath is the simplest, yet most powerful and beautiful doorway to peace in mind. A peaceful mind can serve you with clarity; to know and stay focused on what’s your purpose and intention is absolutely essential on a tight schedule and in the rollercoaster of life. The movements in the Ashtanga Yoga practice aligned with your breath make you incredibly strong. Strong for the challenging moments, for rising up from failure, for steeping into your vulnerability and transcending it into courage. The juice of the results from Ashtanga Yoga lies in a consistent and disciplined practice. It’s a form of discipline rooted in self-love and a consistency, that grows from acceptance and surrender. When your life’s upside down (it happens every now and then), the practice of Ashtanga Yoga will be along your side, guiding you on our path. It becomes a trustworthy friend. By practicing Ashtanga Yoga you’ll nourish your body in a way, that you’ll rock your life even in a high age. This practice’s about the “long-term”, meaning, what you put in your body today will define your tomorrow. In my opinion, these are some precious qualities for life, that you’d need to work on every single day. And Ashtanga Yoga can help you do that. What Im trying to say is, that you ARE a super hero, yet let's not forget YOU. So would you give Ashtanga Yoga a try? Common, babe! You’ve got to feel it. Because it’s experimental. Magnificent. Daring. And so is life! FEFI - Feira Empreendedorismo Feminino Intercultural. A intercultural market for female entrepreneurs. @Quinta da Ribafria, a magical location to start with. Subscribe for your spot here! When you’ve got questions, please drop me a line: roomformyself@gmail.com. Im an eMail away. Remember your dear friend, who may’ve told you just yesterday, that she’s been feeling exhausted, come together and make it an experience! I’d be so grateful to see you there. Im curious about your secret to manage it "all"? Share it please in the comments below and trust, it may support or inspire someone importantly. On my last blog post I received a wonderful feedback. I thank you for that!!! It was not just about the fact, that I had the generous chance to present my work in the magazine “Lideranço no feminino” as a supplement in the newspaper Público. Most importantly, practitioners and I, we opened up a conversation about the deeply personal meaning of our Ashtanga Yoga practice and its connection to daily life. Specifically, there’s this one respond, that touched me. In this blog post, you’ll find the eMail from Beatriz. There was just no other way to share it originally. In respect and agreement with her, I changed the name. In her eMail Beatriz shared with me so beautifully, honestly and purely her daily life. This alone is precious and makes me feel honoured, that she allows me in her life. Because, I believe so strongly in the beauty and power of ordinary daily life, of the little priceless moments of human connection among family, friends and encounters. So I also trust, that the practice of Ashtanga Yoga is directly linked to it. Life and Ashtanga Yoga are inseparable for me. Besides of the many unique reasons why we engage with this practice of Ashtanga Yoga, I’ve come to experience that, through it you’ll be able to become strong in diving into your vulnerability. Strong enough, to transcend it into courage and connect purely with yourself, hence with others and play your roles not functional but rather with intention and meaning, love and care. I suppose, it reveals a significant difference between “have” and “be”. What you “have” and “do” in your life, doesn’t define you. It’s about how you engage with it. The way you act, where your action comes from and what you intend to contribute with it. In Beatriz’s eMail it becomes clear, in my opinion. Even though she writes, she doesn’t have much courage, I think, she represents a force of courage - in her intentions for herself, in the way she lives through her daily life, in the effort she takes care of her to be her best, contributes and serves others. Last but not least, I’d love to thank Nuno Filipe from Ashtanga Yoga Carcavelos, because he gets mentioned in Beatriz’s eMail too. You do so greatly. I appreciate your generosity and gentleness and clarity in your teachings. Beatriz said, she trusted me in my recommendation and you earned her trust too. It means a lot to me, because Im aware of the responsibility of teaching. Not only Ashtanga Yoga. Any teachings. Teaching is sacred! So thank YOU! Deeply grateful! Finally, I invite you take some of your precious time and read the eMail through. There’s so much shared wisdom, grace and humility. This is going to be a difficult email to write because English is not my “natural” language. Or I’m just apologise myself because I’m insecure about writing in English, as I am insecure about a lot of things in my live. The context: I am 45 (almost, just a few days). I am a mother, not single, of a beautiful and supporting boy of 12 years old. And I am a working person, 8h30 to 17h, every day with 3h of commuting time. I do Ashtanga yoga twice a week most weeks, 1 time sometimes, have breaks and come back to Asthang again, lay my mat, take a deep breath and start again. From the beginning if I need it. The why: some time ago I went to a workshop with you. I was the only one. I liked but I didn’t have the time to attend your classes. I was sad because of that. But then you told me about Nuno, a professor who could have a more flexible schedule for me, with later hours. I never had a men as a professor, I was a little bit concern about it. But I believed in you and I contact him and now I attend his classes. So, thank you. Reading you story I can imagine the courage you needed to take that step. In fact, I can only imagine a fraction of that courage. Probably I don’t have and never had that kind of courage. So I take what I can, wake up every day, kiss my boy goodbye each morning, fix dinner, read a story because he likes it, try my best to be a good mother, pass good examples, a good wife to my very supporting husband, do my work at office the best I can and not stress a lot. This is my battle every day. Everybody have some kind of battle going on. Who do I want to become? Myself, I guess. To be honest in my examples and attitudes, to be honest to myself and to find room inside me. If I can be this every day, this will be my legacy. I think it’s enough. Through my work, Im humbled to meet such extra-ordinary people. I trust, you do so well in your life too. Remember yourself of it every new dawn! Count your blessings and make an ordinary day worth your breath! When you feel encouraged to share some insights of your story and how Ashtanga Yoga’s helped you along the way, let us know in the comments below! There’s the chance, you may touch and inspire someone else too. ONE is good enough to have a lasting impact! Or simply like this post, when you like it. In the meantime, I’ll see you on the mat. My teaching commitments are here! When you’d like to reach out personally, just drop me a line: roomformyself@gmail.com. Always glad, to hear from you! Be good to yourself! Happy Spring! P.S. : When you think your friend needs to read this or may want to make "room for myself" then please feel free to share this. I appreciate it. 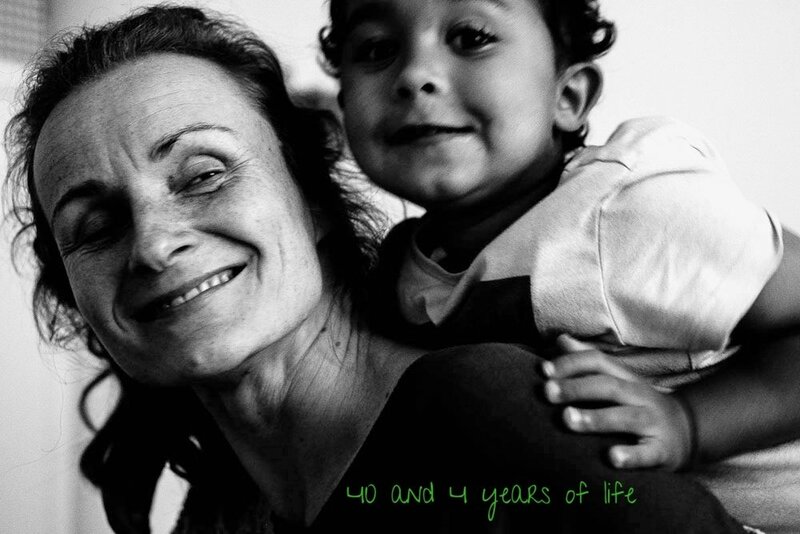 40 & 4 YEARS OF LIFE 2017! There we are. Us two. Zion turned 4 years and me, Im hitting the four-zero. LOVE IT! Below, there're the details about the activities, how to reserve your spot and a little bit of my thoughts, why Id love to see you there. Bring your family and friends! Turning 30 I put myself on “Mission 30” (see post here). This mission was about changing my life. I didn’t know, what I was looking for but I took the leap. Along the way it became clearer, more concrete, tangible and SO enjoyable. Arriving at a point, where past has almost ;) been accepted, future remains unknown (and just always will) I found, my personal “changing my life” story is about worthiness and belonging, faith and inner freedom. While growing into those beautiful inner values I figured life IS constant change. It’s a dance of events and happenings, commitments and surrender, success and failure, love and pain. Its about how I approach it and what I choose and why. For the next round of 10 years, Im asking myself what is truly essential in my life and how can I make my decisions based on that. Im not fully sure yet. My heart is circulating around trust, abundance, feminine strength, JOY, creation, independence. Most important, the path is walked in solitude. Yet, we aren’t alone. Ashtanga Yoga teacher Peter Sansons, who has my utmost respect, in the beginning of his talk he always thanks the organisers of the workshop. He does this in such a peaceful and determined way, that I feel, I could dive in his vast space of gratitude. “Isn’t it beautiful how many people EASE our path every single day”. I felt goosebumps. Because Ive been aware of it all along my way. We crossed path as well. That’s why we, Zion and I, would love to hang out with you, say thank you and celebrate with you LIFE. With what we love most. Yoga, Ocean, Sport, Nature - and YOU. We’ll meet at Praia da Duquesa, CASCAIS, 2750-642, Portugal, at BEYOND BOARDS Beach station. While enjoying a day on the beach here are activities we love to share with you. We’ll be there from around 9a - 1p. Bring your mat & towel! Everyone is welcome. Kids from age 12 yrs. My gift to you! Kids age 2-5 years. Moms and Dads can join in. The giant board is there for us to have a moment of fun on the water. Whoever wants to jump on is so welcome! We’ll arrange it in the morning spontaneously. From 11:30a Carmen will bring on some delicious veggie muffins. YOU ARE WELCOME JUST TO HANG AROUND WITH US. Invite your family and friends too! Let's see, what this day will offer! That’ll give us the great opportunity to plan out the activities for you well. Any doubts, please leave a comment below! My birthdays I usually spent quiet. But life is change ;). So much looking forward to you! With love, gratitude and goosebumps.